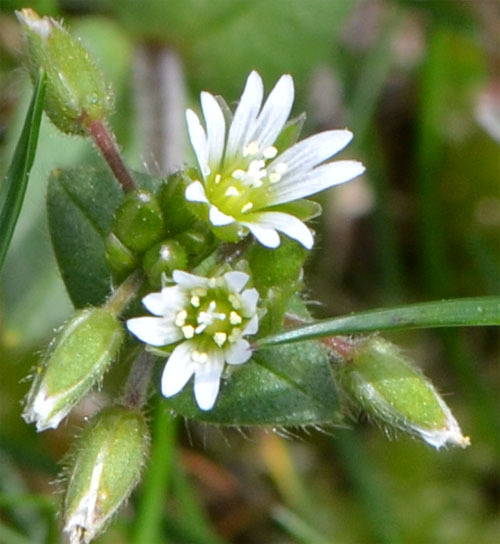 It makes sense to discuss these two plants in the same blog, as they are both very common, look very much alike, and can often be found next to one another… Both forms of chickweed have leaves that are elliptical in shape and alternate on the stem. Common chickweed leaves are hairless while the mouse ear chickweed leaves are covered in tiny hairs. The flowers are small and white, and extremely deeply lobed – If you said there are 10 petals you would be wrong – there are only 5. Mouse ear chickweed flowers are a bit smaller and more oval than that of the common chickweed. Chickweed seeds are often an ingredient of chicken feed – that explains the name. Those same seeds have a more sinister side to them, however: They are produced by the thousands and they are viable for 25 years or more. Additionally they survive the digestive systems of livestock and birds alike – good luck getting rid of the plants if that is your intent. Chickweed is also an important host plant to the Cucumber Mosaic Virus (CMV), a disease that was discoverd in cucumbers but that affects many other vegetables such as squash, melons, peppers, beans, tomatoes, carrots, celery, lettuce, spinach and beets; various weeds; and many ornamentals and bedding plants. Symptoms seen with ths virus include leaf mosaic or mottling, and crop failure. Stellaria media (common chickweed) is a non-native annual (sometimes a perennial under the right conditions) that made it to our shores and has thrived. The plant germinates in fall or late winter, then forms large mats of foliage. Stellaria media is very much edible and nutritious (the plant contains B vitamins, as well as vitamins C and D. It’s also a good source of iron, copper, calcium and sodium), and can be used raw in salads. Chop the leek, or slice the onion fine. Heat some oil on low and stir in the leek/onion. Fry for a few minutes. Chop the chickweed into 2 inch pieces and add to the leek or onion. Beat the eggs and milk together. Combine with leeks and chickweed. Cover and cook until just firm. Eat. Enjoy! Cerastium fontanum is a hardy perennial that easily overwinters. over time it forms large mats. 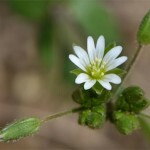 Just like common chickweed, the plant is edible. The leaves are a bit thicker (and hairy) so you may not want to add it to a salad. You need to cook mouse ear chickweed. Sauté the minced mouse ear chickweed and the onion in some butter until the chickweed wilts and the onions have caramelized a bit. Add the chicken broth and simmer for 5 minutes. Blend the mixture with a blender or food processor and add cream. Serve warm.